I am currently doing the Whole30 (round 2, baby!) 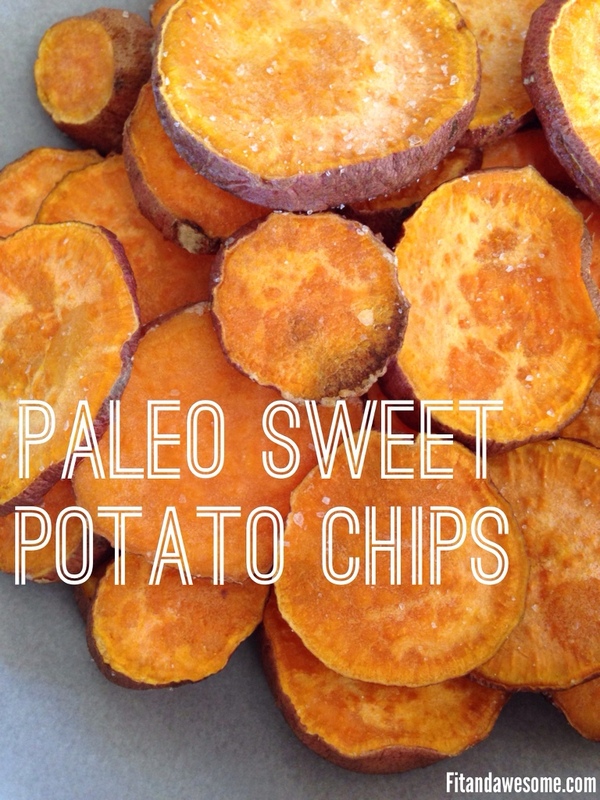 and made these paleo sweet potato chips. 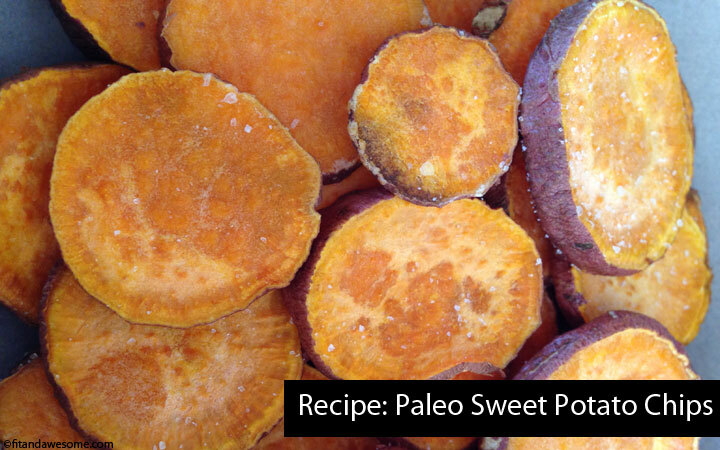 Now, I’ve made sweet potato fries paleo style before (recipe here) and they taste pretty good. But I’ve never tried sweet potato chips. I guess the thought of making “chips” seemed too complicated to me. But it’s not! My friend Luis shared his love for the se sweet potato chips on Facebook and I asked him for the recipe. He sent it over to me and it was love at first bite. These sweet potato chips are so good. They don’t even make me miss regular sweet potato chips. Not even for one second! Yum. I made them to go with my paleo chicken fingers and I ate them all. So tasty. And so easy to make. Sweet Potatoes (after all, you are making sweet potato chips!). I buy a bag from Trader Joe’s and they tend to be a little bit smaller which is good for cutting up into chips. Pre-heat your oven to 400 degrees. Next, cut the sweet potatoes into thin pieces. 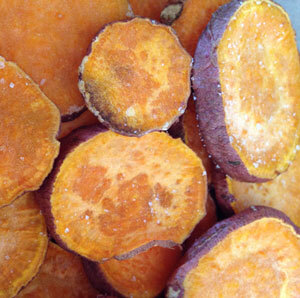 You are making sweet potato chips so you’ll want them nice and thin so they are chip-like. Once the sweet potato chips are cut, lay them out on the cookie sheet. Next, melt coconut oil in a small bowl. You probably only need 1-2 tablespoons. Brush coconut oil on each sweet potato chip. Next, sprinkle with sea salt. It’s up to you how much sea salt you use. I personally like sea salt A LOT so I sprinkled very liberally. Place in the oven and cook for 8-10 minutes. Once done, let cool and serve. This is a great healthy paleo snack to enjoy anytime but don’t expect them to last long around the house. Mine were gobbled up in less than 10 minutes! Delicious. What about you? Have you ever made sweet potato chips before? Have you tried this recipe? How did it turn out? Post in the comments and let me know! Thanks for linking up Lindsay! Looking forward to seeing what you post next week!! Yum, cinnamon would be great on these. Will have to try that next time I’m in the mood for something sweet. So very good! I make these with butternut squash A LOT – it’s just so hard to prepare sometimes… However, sweet potatoes seem FAR EASIER to handle! They are! Especially if you buy the smaller sweet potatoes! Going to have to try butternut squash ones. Those sound yummy, too. These sound yummy, and I have a question. I don’t like coconut, so is there a different oil I can use and still get a good result? Thanks. This is great, I am always looking for Paleo friendly snacks. Do you use a mandolin to cut the chips or just a knife? I wonder if I bit of cayenne pepper or something spicy might also be good on these. I have a few sweet potatoes so I think these will make a great side dish tonight. thanks! This are going in my oven right now! Can’t wait! These look great! I am adding this to the list of things I have to try. Will let you know how it goes! This looks so yummy & simple to make. My daughter loves sweet potato fries, so I’m going to try this healthy snack recipe. I dip mine in homemade guacamole. Amazing! Satisfies both sweet & savory snack in one shot. Hi I followed your recipe but found that the sweet potatoes came out soft and not crispy, I did it twice and the second time I used less coconut oil. Thoughts? Hmm, I’m not sure. Do you live at altitude?